Easy to install but hard for intruders to manipulate. It allows for a wide range of sensors throughout your home. Interactive video surveillance services options. Can monitor pre-existing home alarm systems. More free alarm equipment than any other company. Interactive services via mobile devices. Z-Wave home automation equipment is supported . Gives you the option to mix and match sensors. You can choose how many devices you want to install. Gives you the option to use a landline-based or wireless-based security system. It offers both self and professional monitoring options. It has flexible monitoring plans. For every 13 seconds that passes, there’s a home being robbed. So then how many are robbed every minute? You guessed it! 4 to 5 homes are burglarized every minute in the U.S. which means nearly 6,000 homes are attacked by burglars per day. Scary, isn’t it? What’s more frightening is that most robberies occur while people are away from home, either at work or on vacation. It may not come as complete surprise but homes that don’t have a security system installed fall victim to these burglaries more often than homes that have preventive security measures installed like Frontpoint Security. From the stats the FBI has collected, it happens in 1 out of 3 homes without an active system in place. 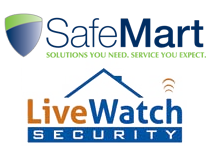 So if you can acquire the best security system to guard what’s most important to you, why wait? 1. On average, it takes less than 60 seconds for a burglar to break into your home. If a burglar can’t break into your home in that 60 second time frame, he’ll leave to find another target. It’s an obvious fact that’s based on cold hard stats. So why would you settle for a simple door lock you bought at Home Depot? That just screams, “BREAK INTO MY HOUSE”. Choose a security system that’s hard to hack. Make sure it has backup power supplies so that burglars can’t sneak in when the electricity goes out. It should also be able to keep your windows as secured as your doors are. Learn about Frontpoint's backup power source. 2. Burglaries often occur in homes that are not protected by security systems. Why do you think security systems include those big yard signs in their packages? Or those decals that you have to stick on your doors and windows? 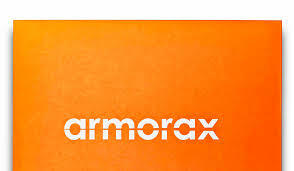 While it may seem like this is a part of their advertising, it’s actually the first layer of protection for your home. It works as a deterrent to ward off thieves. There’s a study that claims that 90% of convicted burglars confessed that they would not risk their chances on homes clearly armed with surveillance and monitoring systems. On the same note, 75% of participants from a separate study also claimed that they would think twice about attempting to rob a house decorated with security yard signs and decals. 3. Burglars seek the most obvious and easiest targets. Burglars choose a home that isn’t visibly occupied. If you’re planning to go out of town or away for work, make sure appearance-wise it still looks like someone is home. 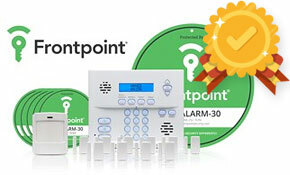 Most of today’s home security systems have automation capabilities (Check out our best selling Frontpoint security system for more on automation). You can set your lights to automatically turn on at night and off in the morning. This can help with your home’s security as burglars are more suspicious of a single light that’s constantly turned on. You can also set the light to respond if there’s movement in your front door or if someone rings the doorbell. You can even set an appliance to work at a specific time so it would appear that someone’s really at home. A reliable home security system is perhaps one of the best ways against burglary. If an intruder has already gained access to your house, the system can alert you so you can find a safe spot inside your home while the monitoring station connects to proper authorities. Law enforcers and medical assistance can then respond faster to your situation. With surveillance equipments, your home security system may even help identify the intruders and aid in investigation. While the main reason why you installed a security system at home is for safety, it can actually do more than to simply secure your home. It can let you save more in the long run. Security systems today have included equipments for detecting smoke and fire. It comes connected to a monitoring station which can alert and dispatch proper authorities when you need it. Some detectors are even more advanced that they can detect signs of fire before it bursts into flames. Actually, it can help save lives and properties if you pick the right one. Most dangerous chemicals can’t be easily perceived by the human senses. Your home may even be filled with gases at dangerous levels and still not know it. Carbon monoxide, for one, can be potentially fatal when inhaled for a long period of time and in great amount. As such, it is essential that you install a detector at home so that you can be immediately notified when the air is already filled with gases at harmful levels. Perhaps, one of the fun part of setting up a home security system is that it can also make your home smart. You can schedule thermostats to make sure the house is at a comfortable temperature when you get home or that the sprinklers in the yard turn off when it starts to rain. As good as it sounds, how would you like to have your coffee done before you even get out of bed? 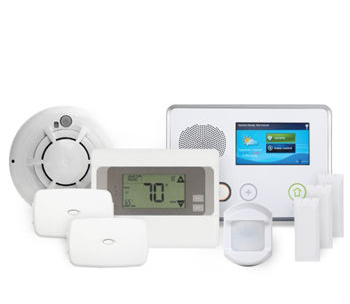 A home security system can be connected with several smart devices. The more devices, the easier it is to control your home. You can get notified when the kids arrive at home from school. With a security camera, you can see if they are doing their homework or not. If you have a two way voice control in your system, you may even reprimand and stop them from arguing. With this, you might not need to call your neighbors frequently to check on your kids. Through home automation, setting up smart appliances at home to work only when needed can let you save on your electricity bill. You get notified if one of your appliances is left turned on and the system can immediately turn it off for you. Some more advanced security systems today can show a report on your monthly electricity consumption. It lets you see which device at home gets the most usage and then, you can adjust accordingly. As a security system is installed in your house, there would be less chances of burglary, fire and water damages happening in your home. With that, there would be less chances of you filing for insurance claims and the like. Your home insurance company will then be able to save money. Their savings are then translated as discounts on your end. Having a home security system doesn’t just deter burglars. It increases your home’s selling price and potential. Most people who are on the search for a new place to move in also considers the type of neighborhood. They find a place that is not only comfortable to live in but assures their safety as well. As such, having a security system installed in a home can boost its price in the market. Securing a safe environment for your family, particularly the children, can spare them the emotional stress and psychological trauma that such unfortunate events can give. Other than the physical threat on their safety, it can mark a child up to his adult life. As such, it is always better to come up with a set of preventive measures than with a dozen of cures. If you can do it now, why do it later?